The above chart is from our October newsletter and is one of 5 charts we discussed in the Storage Performance Council benchmarks analysis. There’s something intriguing about the above chart. Specifically, the band of results in numbers 2 through 10 range from a high of 45.7 to a low of 41.5 MBPS/drive. 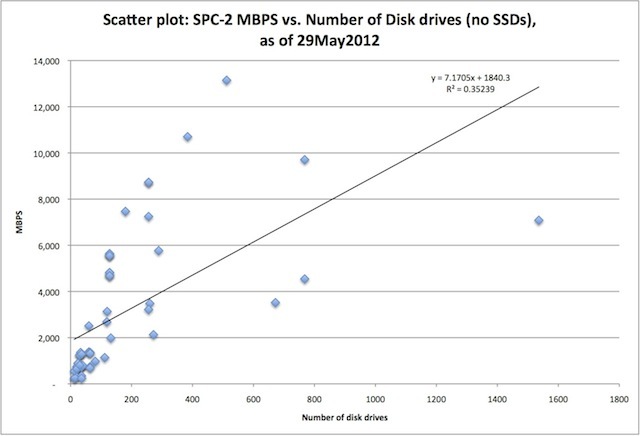 The lone outlier is the SGI InfiniteStorage system which managed to achieve 67.7 MBPS/drive. It turns out that the SGI system is actually a NetApp E5460 (from their LSI acquisition) with 60-146GB disk drives in a RAID 6 configuration. Considering that the configuration ASU (storage capacity used during the test) was 7TB and the full capacity was 8TB, it seemed to use all the drives to the fullest extent possible. The only other interesting tidbit about the SGI/NetApp system was the 16GB of system memory (which I assume was mostly used for caching). Other than that it just seemed to be a screamer of a system from a throughput perspective. Earlier this year I was at an analyst session with NetApp where they were discussing there thoughts on where E-series was going to focus on. One of the items was going to be high throughput intensive applications. From what we see here, they seem to have the right machine to go after this market. The only storage to come close was an older Oracle J4200 series system which had no RAID protection, which we would not recommend for any data application. Not sure what the IBM DS5300 series storage is OEMed from but it might be another older E-Series system. These systems all use 140GB disks or larger. 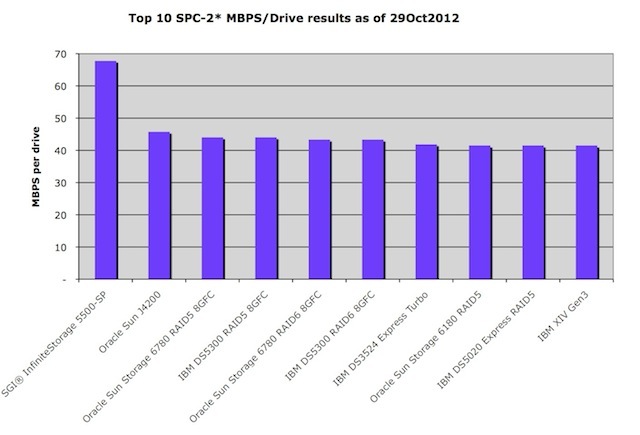 (Some earlier SPC benchmarks used 36GB drives). Also, please note the MBPS SPC-2 metric is a composite (average) of Video-on-demand, Large database query and Large file processing workload. More information on SPC-2 performance as well as our SPC-1, SPC-2 and ESRP ChampionsCharts for block storage systems can be found in our SAN Storage Buying Guide available for purchase on our web site). The complete SPC-1 and SPC-2 performance report went out in SCI’s October newsletter. But a copy of the report will be posted on our dispatches page sometime this month (if all goes well). However, you can get the latest storage performance analysis now and subscribe to future free newsletters by just using the signup form above right. As always, we welcome any suggestions or comments on how to improve our SPC performance reports or any of our other storage performance analyses. The above chart was from our July newsletter Exchange Solution Reviewed Program (ESRP) performance analysis for 1000 and under mailbox submissions. I have always liked response times as they seem to be mostly the result of tight engineering, coding and/or system architecture. Exchange response times represent a composite of how long it takes to do a database transaction (whether read, write or log write). Latencies are measured at the application (Jetstress) level. 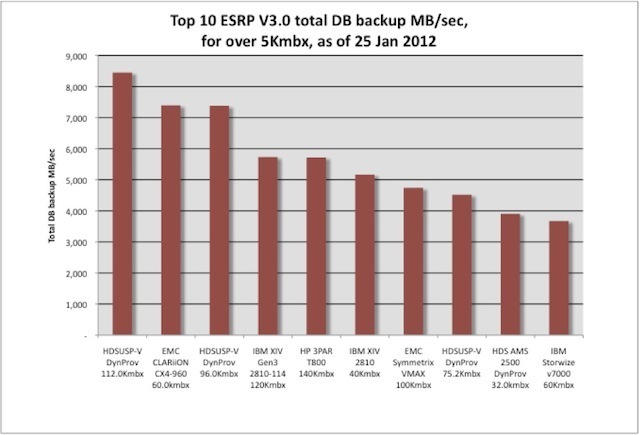 On the chart we show the top 10 data base read response times for this class of storage. We assume that DB reads are a bit more important than writes or log activity but they are all probably important. As such, we also show the response times for DB writes and log writes but the ranking is based on DB reads alone. In the chart above, I am struck by the variability in write and log write performance. Writes range anywhere from ~8.6 down to almost 1 msec. The extreme variability here begs a bunch of questions. My guess is the wide variability probably signals something about caching, whether it’s cache size, cache sophistication or drive destage effectiveness is hard to say. 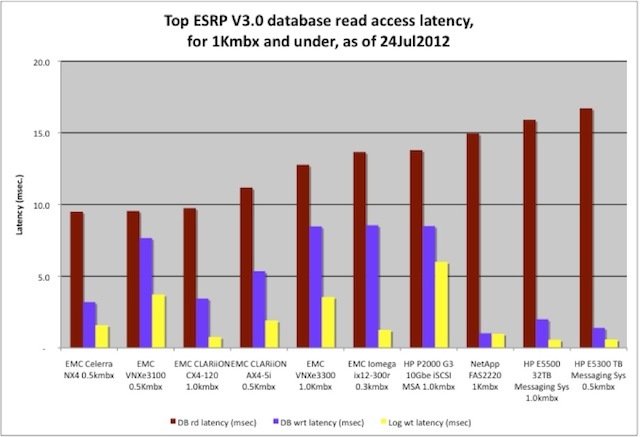 Why EMC seems to dominate DB read latency in this class of storage is also interesting. EMC’s Celerra NX4, VNXe3100, CLARiiON CX4-120, CLARiiON AX4-5i, Iomega ix12-300 and VNXe3300 placed in the top 6 slots, respectively. They all had a handful of disks (4 to 8), mostly 600GB or larger and used iSCSI to access the storage. It’s possible that EMC has a great iSCSI stack, better NICs or just better IO scheduling. In any case, they have done well here at least with read database latencies. However, their write and log latency was not nearly as good. We like ESRP because it simulates a real application that’s pervasive in the enterprise today, i.e., email. As such, it’s less subject to gaming, and typically shows a truer picture of multi-faceted storage performance. 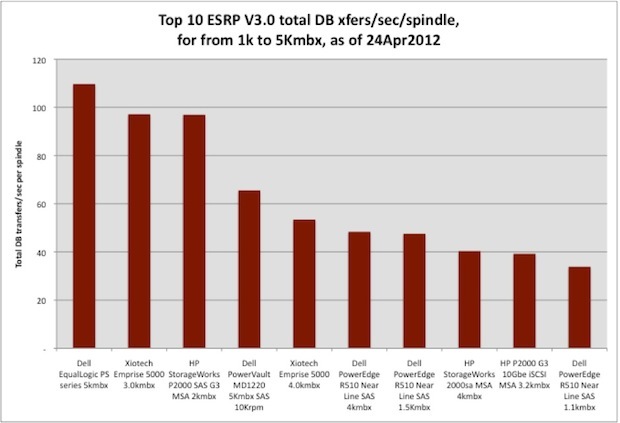 The complete ESRP performance report with more top 10 charts went out in SCI’s July newsletter. But a copy of the report will be posted on our dispatches page sometime next month (if all goes well). However, you can get the ESRP performance analysis now and subscribe to future free newsletters by just using the signup form above right. For some time now I have been experimenting with different approaches to normalize IO activity (in the chart above its NFS throughput operations per second) for systems that use SSDs or Flash Cache. My previous attempt (see prior SPECsfs2008 chart of the month post) normalized base on GB of NAND capacity used in a submission. I found the previous chart to be somewhat lacking so this quarter I decided to use SSD device and/or Flash Cache card count instead. This approach is shown in the above chart. Funny thing, although the rankings were exactly the same between the two charts one can see significant changes in the magnitudes achieved, especially in the relative values, between the top 2 rankings. For example, in the prior chart Avere FXT 3500 result still came in at number one but whereas here they achieved ~390K NFS ops/sec/SSD on the prior chart they obtained ~2000 NFS ops/sec/NAND-GB. But more interesting was the number two result. 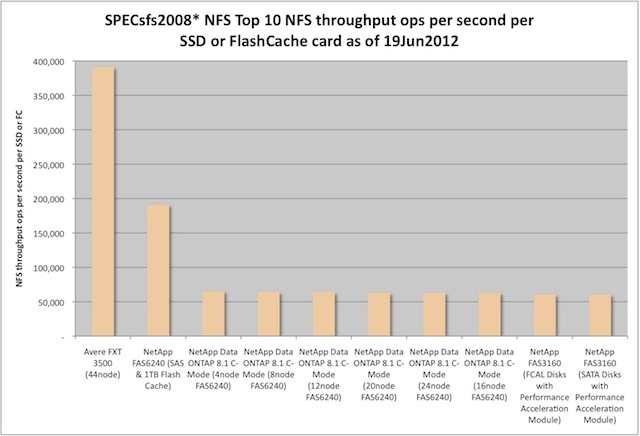 Here the NetApp FAS6240 with 1TB Flash Cache Card achieved ~190K NFS ops/sec/FC-card but on the prior chart they only hit ~185 NFS ops/sec/NAND-GB. 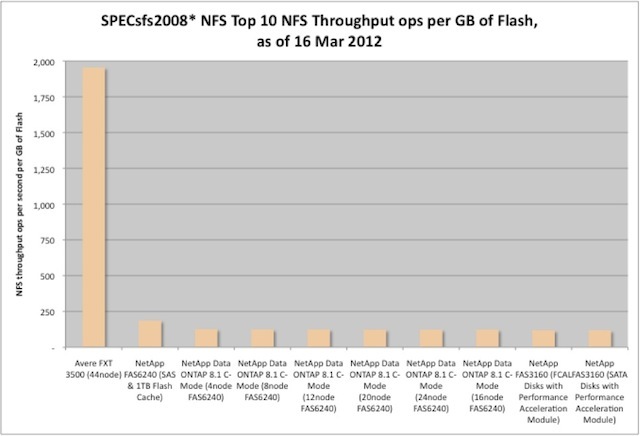 That means on this version of the normalization the Avere is about 2X more effective than the NetApp FAS6240 with 1TB FlashCache card but in the prior chart they were 10X more effective in ops/sec/NAND-GB. I feel this is getting closer to the truth but not quite there yet. We still have the problem that all the SPECsfs2008 submissions that use SSDs or FlashCache also have disk drives as well as (sometimes significant) DRAM cache in them. So doing a pure SSD normalization may never suffice for these systems. On the other hand, I have taken a shot at normalizing SPECsfs2008 performance for SSDs-NAND, disk devices and DRAM caching as one dimension in a ChampionsChart™ I use for a NAS Buying Guide, for sale on my website. If your interested in seeing it, drop me a line, or better yet purchase the guide. The complete SPECsfs2008 performance report went out in SCI’s June newsletter. But a copy of the report will be posted on our dispatches page sometime next month (if all goes well). However, you can get the SPECsfs2008 performance analysis now and subscribe to future free newsletters by just using the signup form above right. 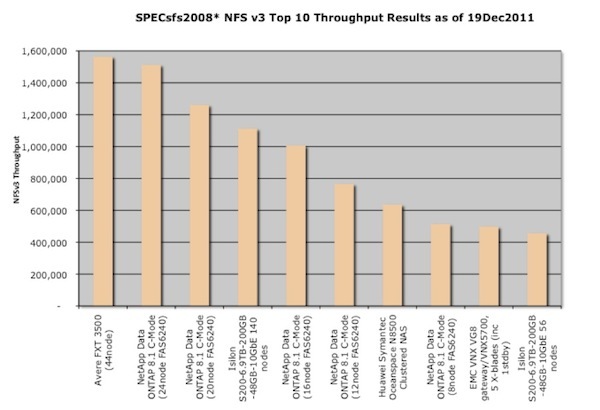 For a more extensive discussion of current NAS or file system storage performance covering SPECsfs2008 (Top 20) results and our new ChampionsChart™ for NFS and CIFS storage systems, please see SCI’s NAS Buying Guide available from our website.